First, check that we service your location by typing your full address into the address bar. If we do service your address, you’ll be brought to the order page where you can choose from a set list of items. Simply choose a quantity and add to your cart. When you’re happy that you have everything selected, you can proceed to pick a date and time. We’re happy to collect from you 6 days a week (except Sundays & Bank Holidays) anytime from 8am to 8pm. So, just select a date and choose an available slot and we’ll be there within that time slot. Once we’ve received payment, your job will be scheduled with our team, and we’ll email you the details. But there’s always someone ready to help if you need it on 1800 248924 or at home@citybin.com. So, that’s it, a simple way of dealing with all that junk you’ve been promising yourself you’d get rid of! The image below shows the load capacity with some common items (for illustration purposes only). A full load is the equivalent of approx. 100 moving boxes and should weigh less than 1,000kg. A half load is the equivalent of approx. 50 moving boxes and should weigh less than 500kg. A quarter load is the equivalent of approx. 25 moving boxes and should weigh less than 250kg. If you’re unsure about anything, just give us a call on 1800 248924 and we’ll be able to advise. Here’s a few helpful tips to ensure you get the very best from the service. 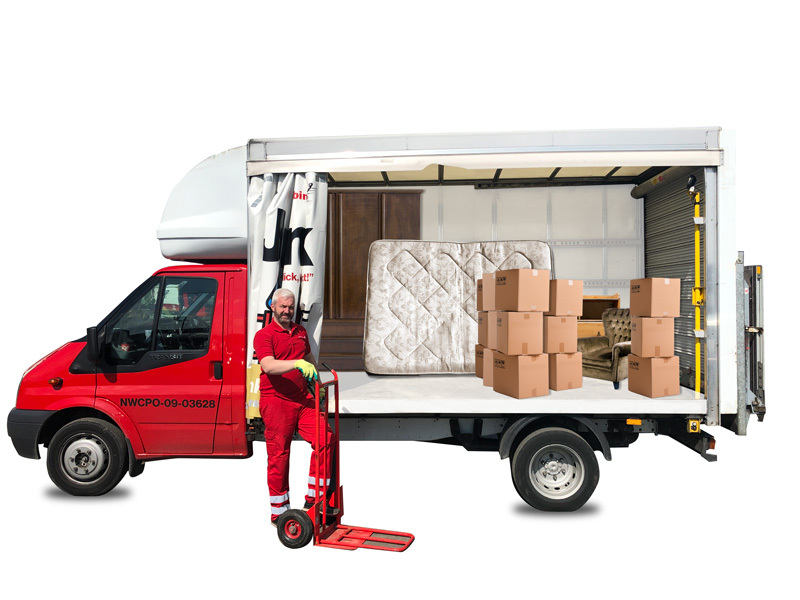 If you’re not sure of the list of items you want us to collect, or it’s not on the list, then perhaps consider booking a full or half van, hiring a skip, or call us on 1800 248924 and we can advise. We have a minimum charge of €25 per visit – any less and it just wouldn’t work, sorry. Our staff aren’t allowed to go in to your home or premises (for lots of sensible reasons). So, we have to rely on you leaving your items outside your door – hope that’s okay. If you can’t be there at the time of collection, that’s fine, we’ll get it done for you. But, in these instances, we can only collect items on the list and items that have been paid for in advance. If there’s anything extra left outside, we will try to contact you e.g. to make sure it’s okay to take it away and update your bill. If your property is a terraced house or on a public pathway your council will not allow you to leave junk on a public area in a way that is unsightly or causes an obstruction. This means you must be present at the time of collection. Please make sure you empty any furniture of items that may not be intended to be thrown away – such as clothing from wardrobes etc. Also, please refer to the Prohibited Items list below. No hazardous or liquid waste can be accepted. Only items that are booked can be accepted. Due to our waste permit restrictions and for the safety of our crews, we cannot accept the items shown on the list here: Batteries; Gas Cylinders; Fluorescent Tubes; Paints, Thinners, Oil etc. ; Asbestos; or any Electrical or Refrigeration product. Please make sure that any item for collection is free from any of the prohibited items.